Finding the right type of carpet for your home or business is easy when you visit The Floor Trader of Modesto. While every property has different needs based on its specific functions and unique design requirements, there’s no better way to narrow down your choices than by consulting with our experienced professionals. When you first visit our carpet store, you’ll be greeted by one of our friendly and knowledgeable sales staff members, who will help you begin the search for the perfect carpet. We set ourselves apart from other carpet stores in Modesto, CA, and the surrounding areas with our guaranteed low prices and comprehensive service plans. From helping you find the right carpet for your project to installing it in your commercial or residential property, we are committed to providing the complete package when it comes to serving your flooring makeover experience. Whether you’re in the market for an area rug or a carpet, you can depend on our extensive selection of high-quality carpet floors available in a wide range of durable materials that require minimal maintenance. 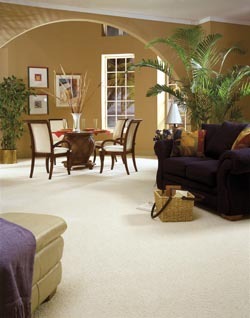 We take into consideration a number of factors when guiding you toward the ideal carpet for your residence or business. With unbelievably low carpet prices on styles that match any lifestyle, you can count on our showroom as your destination for cost-effective and fashionable carpeting. Choosing the right carpet is just the beginning of your interior design makeover. After you’ve found the style that meets your unique personal requirements, you can depend on our crew of professional contractors to finish the job with a complete carpet installation. We combine extensive experience in the industry with the latest technology to provide efficient installations in a timely manner so you’ll be able to enjoy your new carpet in no time. From updating damaged floors that have become worn from years of foot traffic to finding a new floor for an upcoming construction project, we offer commercial carpet solutions that are designed to meet your every need. When you need a new carpet for your office, warehouse, or any other commercial space, you’ll be sure to find what you’re looking for at our flooring store. Even if you’re not looking to cover entire rooms of your home or business, you can still benefit from the style and convenience of carpet without the long-term commitment and maintenance requirements of standard carpet. With fashionable area rugs available in a wide array of colors, patterns, and sizes, you’ll be able to pull any room together with a classy and timeless flooring accessory that matches your existing décor. Contact our staff today to find out more about how we stand out from other carpet stores. We serve clients in Modesto, California, and the surrounding areas.